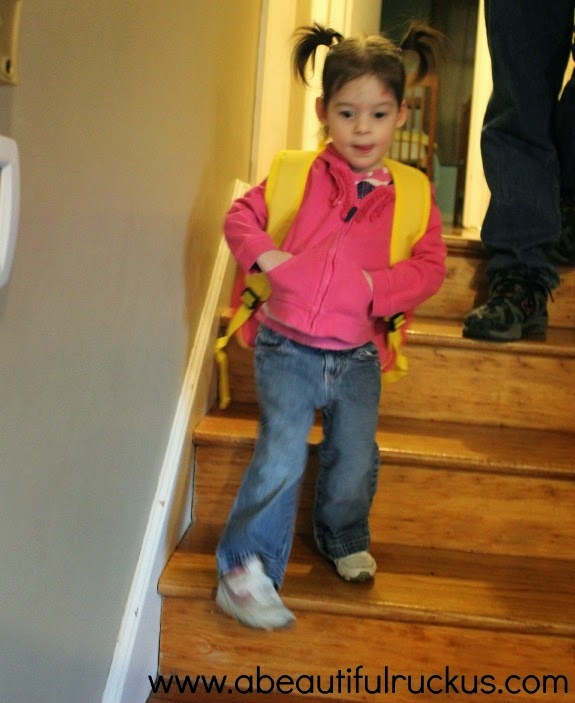 A Beautiful Ruckus: First Day of Preschool - Third Time's a Charm! First Day of Preschool - Third Time's a Charm! 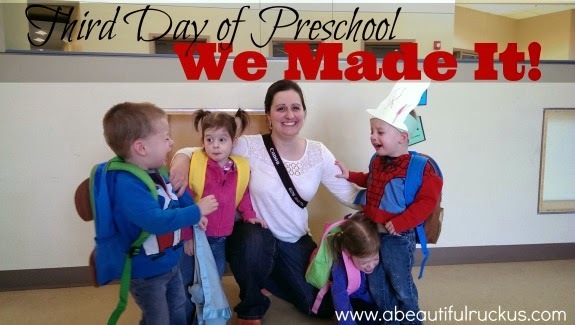 We *finally* made it to preschool! 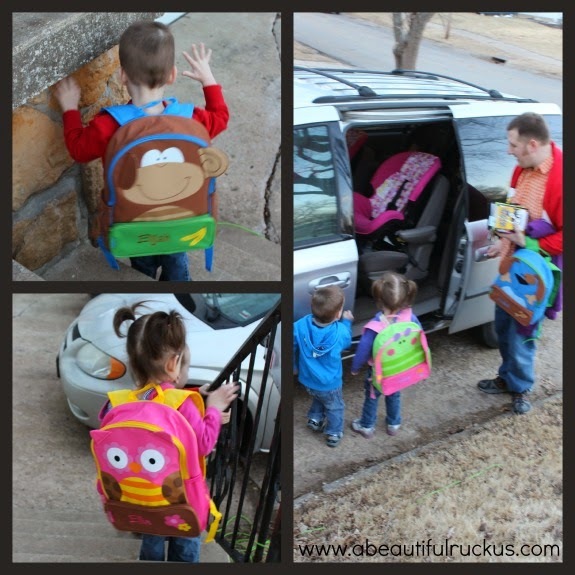 After a full week's worth of delays, Monday found us up bright and early to start our new adventure of "going to school." 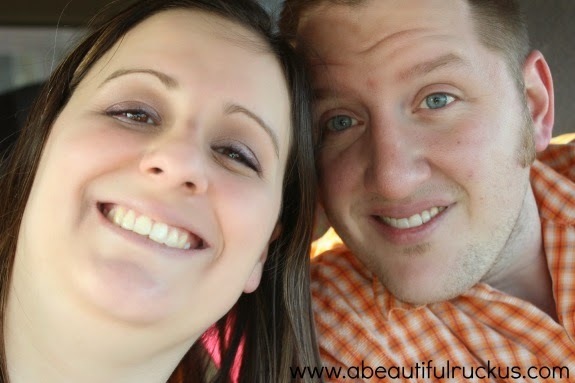 This post is full of photos, because, of course, I had to document this new chapter. 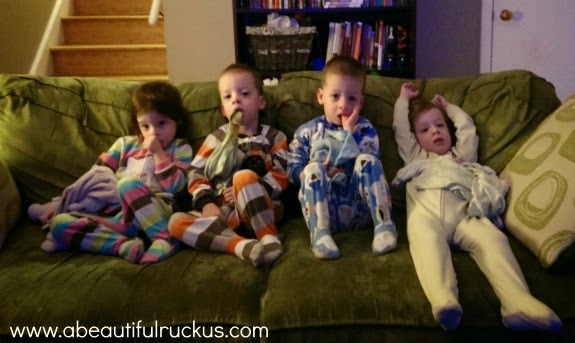 The Ishum Quads Start Preschool!! The expressions on their faces would make you think that we pulled them out of bed at 4am. In all actuality, it was 7am...but in their defense, it was the day after Daylight Savings, so their little bodies thought it was an hour earlier. We got them ready for the day and sat them down for breakfast. Once again, we tried to explain that we were going to go to school (we've been talking about it with them for weeks). I'm not sure that "school" made sense, but when we said that they could take their new backpacks with them, they were ALL about it! Except for Abby. She was still mad at us for making her wake up and embrace the day. Around about this time, I started praying that Abby would snap out of it for her teacher's sake. We got the kids into jackets (it was such a pretty day! 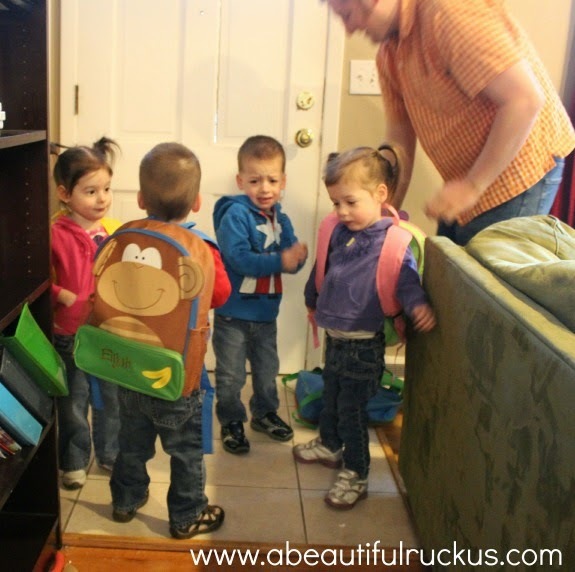 ), and tried to help them put on their backpacks. Most of them cooperated, but you can see in this photo that Caleb just wasn't having it. And then I started praying for HIS teacher. We had a couple of very tired kids. Ellie, though, was SO excited! I really think she understood what we were doing because of the LeapFrog "Back to School" movie. 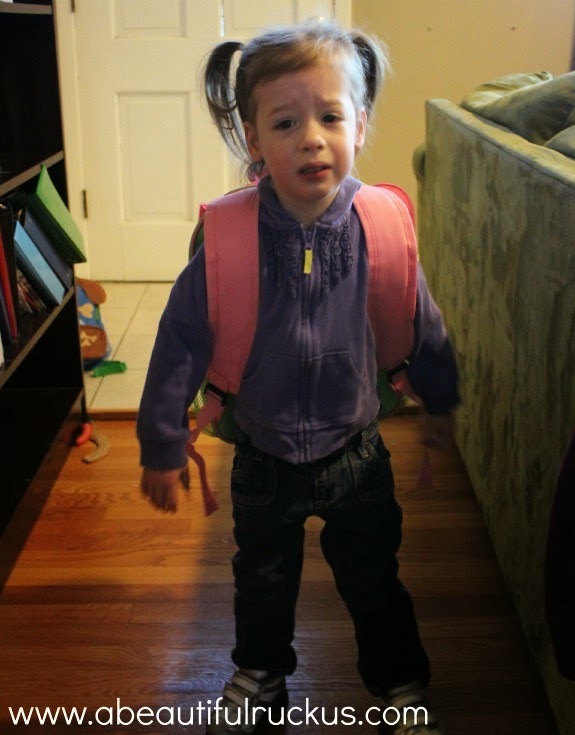 She paraded around the house with her hands in her pockets and her backpack on her back, just like a big kid. She was so proud to take her Owl backpack with her. Yes, Abby. We know that you are still tired. And then Elijah (back left) decided that he was tired too. Great. 3 out of 4 kids are tired and cranky. 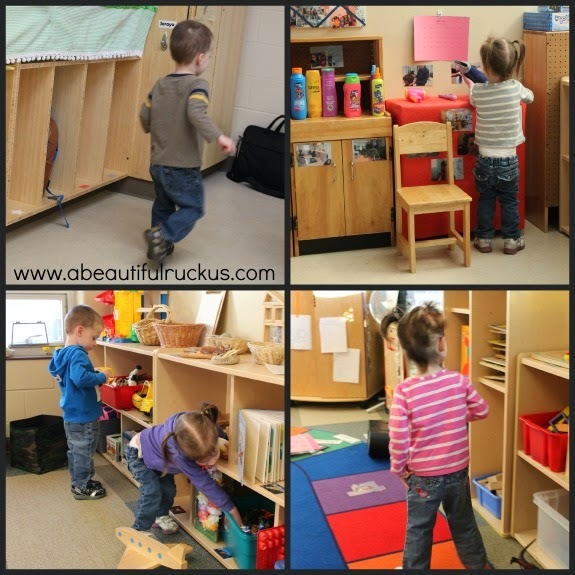 Clockwise from top left: Elijah running from art station to dramatic play area, Abby exploring the dramatic play area, Ellie looking at the books and puzzles, and Caleb and Abby discovering the fun toys that they get to play with. We arrived at school about 15 minutes early. We wanted to take a few photos and have enough time to drop them off in four separate classrooms without feeling rushed. Elijah's teacher saw us walking in and kindly invited us to bring all four to her classroom to let them acclimate in there while the rest of the teachers arrive. The kids immediately started exploring, and I think those extra minutes together helped them see the fun that they were going to have before we split them up. So how did it go when we actually walked out of each of their classrooms? They didn't even notice that we left. True story. Everyone was far too busy playing and exploring to be bothered with Dad and Mom slipping out the door. Me: (to Sean) They didn't even notice that we left. It's like they don't need us. Sean: They need you. Wait until about 3:30 this afternoon when they are exhausted. So...we went to breakfast! It's been years since we've done that! 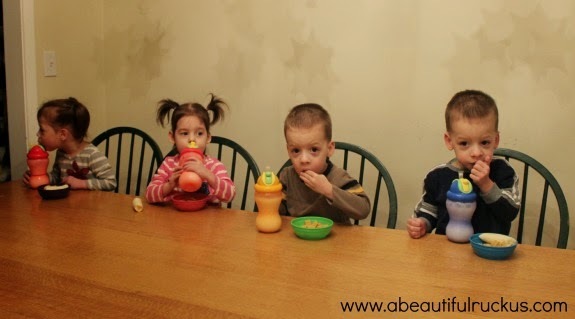 In fact, I think the last time we went to breakfast was the day that they found four little blips in my uterus. I was horribly sick, and they said that they could get me in for an ultrasound if we could wait an hour. We ran to Chick-fil-A where I got a sandwich, ate a bite, and handed it to Sean before I threw up. 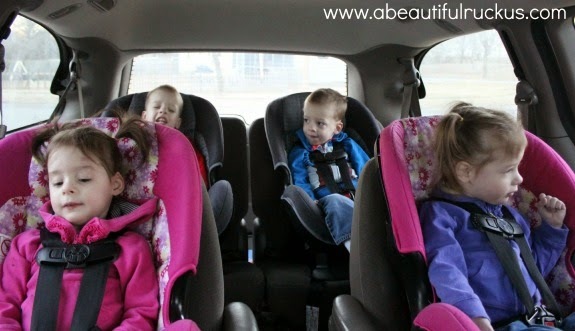 Then we went back to the doctor's office and found out that quadruplets were on the way. So yeah, it's been a really long time. Caleb and Ellie are in sister classrooms, meaning that they are connected to each other by an open hallway and have several activities throughout the day together. However, they are "officially" in different classrooms. Abby and Elijah are in sister classrooms as well. I'm really glad that all of them have a buddy one room over that they can very easily go see. It gives them the security of each other, and the challenge of being on their own. The rest of the week has gone very smoothly! 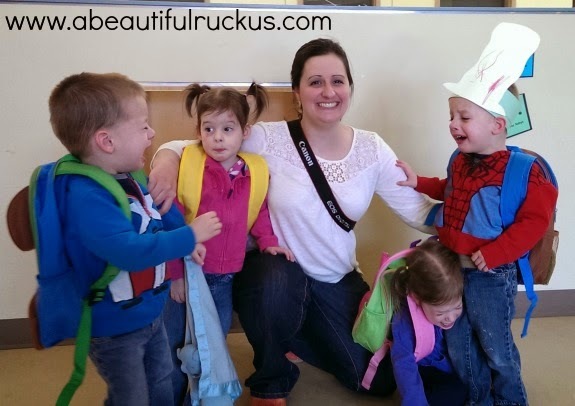 The kids all enjoy preschool and don't cry when they go into the building (which is why I think they like it), but it's always touch and go afterward as they are so tired. Caleb has started taking a 10 minute catnap at school. He just curls up in the corner and zonks out for a few. LOL! So it will take some adjustment. The only downside of starting preschool this week? Spring Break is next week! That means that they won't go back until a week from Monday which means...that we basically get to start all over again! We are so grateful that the kids get to participate in the Special Education program! It's a big blessing for us to have so many dedicated teachers and therapists working with them to help them catch up. One week in, and we are already thrilled with everyone and everything. Wow, God is good, isn't He? Where my knowledge fall short, He has provided people who specialize in developmental delays. Yay! Here is to a great experience in preschool! so cute! I am glad it went relatively good. We start preschool this fall and I fear how those first few days will go. And those backpacks are super cute! Where did you get them? Where did you get their backpacks? I love them. Love the share!! The pictures are priceless. Aw so cute! I'm so grateful for the special education preschools in our district too! My 5yr old has been in it since he turned 3 because of speech delay and it has been such an amazing help for him. This is SO incredibly fun to read!!! As a preschool teacher, I always wonder what a parent's perspective is :). What an exciting journey for you all. I can't wait to hear more soon! Next post request what do YOU do while they are at school??? I love that last picture! It looks like Ellie is saying, "Oh my goodness, my siblings are embarrassing me here. Mom, please make them stop!" Glad you guys finally made it! Where did you get their backpacks? Yay! I am glad they started preschool after the week of delays. It looks like a fun place with nice teachers. I love their cute backpacks! I swear, my 9 year old still has moments like that when he has a tough day. But eventually, they tell you about their day and then mommy gets to feel like she is truly needed still. That's cute how you documented their whole day with pictures, even one with each of their teachers! So glad that school was fun for them. Ellie's pigtails are adorable. Such a big milestone and you covered it beautifully. I'm sure next week when they go back they'll fall right back into the routine. Might take a couple minutes, but it will happen. Maybe Ellie's love for school will rub off on the others.